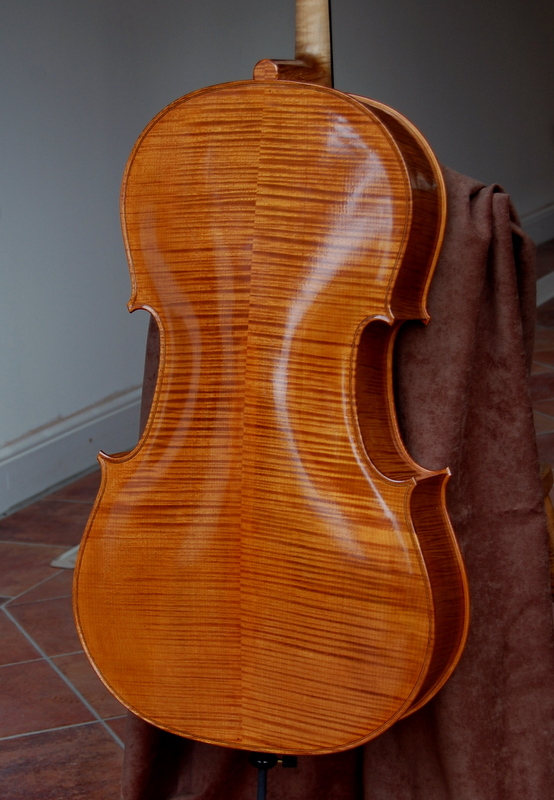 The varnish on the cello has hardened up enough to allow it to be re-strung and I’ve posted a few photographs of the completed instrument below. I’ve been adjusting the bridge and the soundpost to get the best sound out of the instrument and to try to minimise a wolf note that takes over between F and F# on the G and D strings. The wolf is less fierce now the instrument has been varnished than it was when it was in the white. But I really don’t know whether that’s a direct result of the varnish or whether it’s other changes that I’ve made, which include re-fitting the bridge and the soundpost and lengthening the tailgut. Although it’s between notes, the wolf is still fairly obvious and I think likely to cause a problem to a player, particularly in the first position on the D string. Perhaps physicists understand wolf notes, but I’m doubtful that there’s much science in taming them. James Beament gives a partial, although not entirely satisfying, explantaion in his book The Violin Explained. Arthur Benade also discusses them in Fundamentals of Musical Acoustics but I found his account almost incomprehensible. I asked around for advice and got as many opinions as people I consulted. 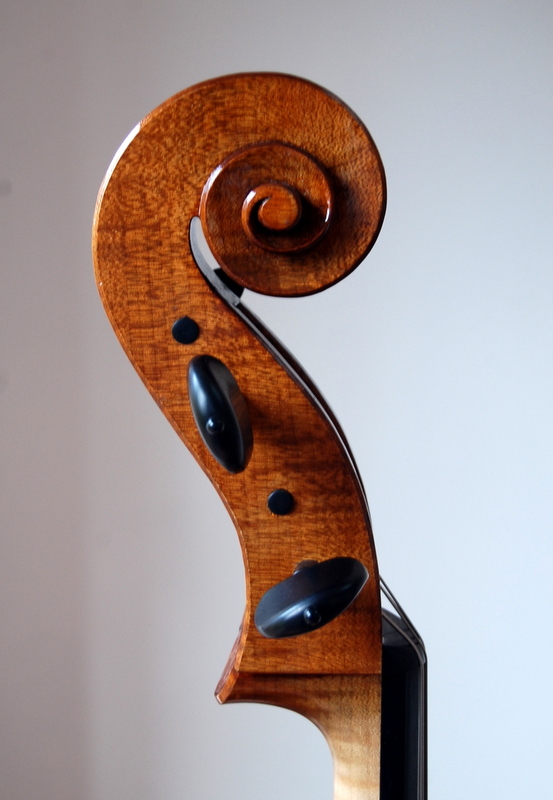 An experienced cello maker told me that I had probably thinned the top too far and that rather than trying to suppress the wolf, which would probably adversely affect the instrument’s performance, I should move the soundpost closer to the bridge and tell the cellist that they need to find a way of playing around it. 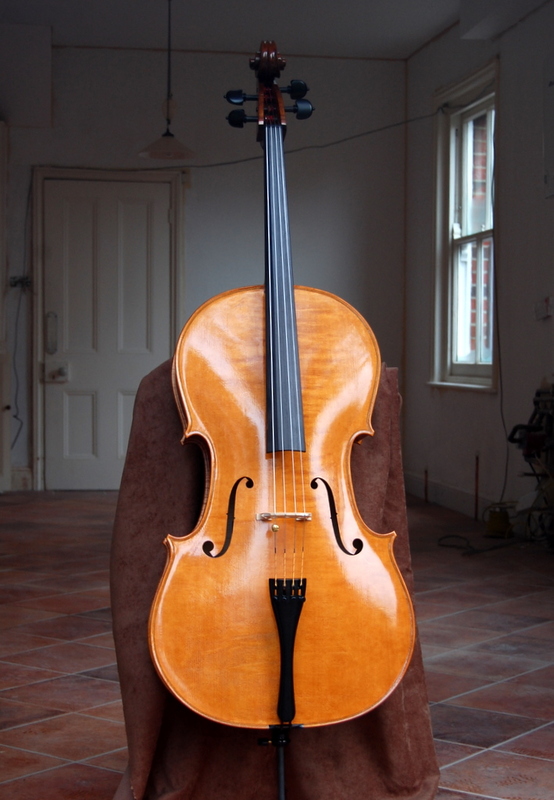 By contrast, other cellists and makers told me the opposite: that many good cellos have a wolf note, that it’s not an indication of a badly made instrument or an overthinned top and that it’s usually possible to suppress the wolf without compromising the sound of the instrument. Robin Aitchison and Sarah Mnatzaganian have written a helpful article, which is available on their website: Wolf Notes and How to Tame Them. And there’s a useful discussion in Strings magazine. However, I gradually realised that, for all the talk of tuning the tailpiece and absorbing the resonance at particular frequencies, there’s no coherent theory of wolf note suppression. It’s largely, if not entirely, a matter of trial and error. The fact there are so many types of wolf suppression devices available only reinforces this view. If any one of them worked consistently well, without any adverse effects on how the instrument sounded on other notes, it would surely dominate the market. In the absence of a plausible theory, it seemed sensible to start with the simplest and most easily reversible of these devices – a small weight on the G or C string between the bridge and the tailpiece. 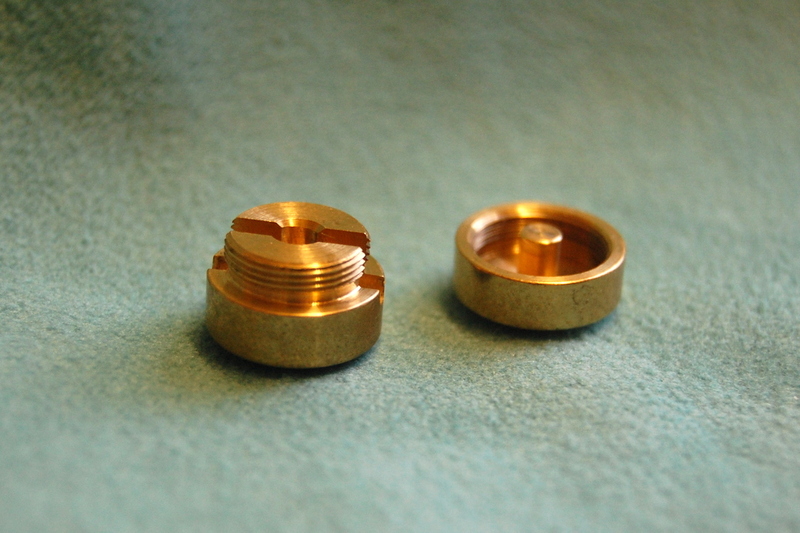 David Bice at New Harmony makes a series of them, in different weights. The design is rather clever in that they stay on the string without the need for a rubber liner, thumbscrew and locknut of the conventional type of wolf note suppressor. 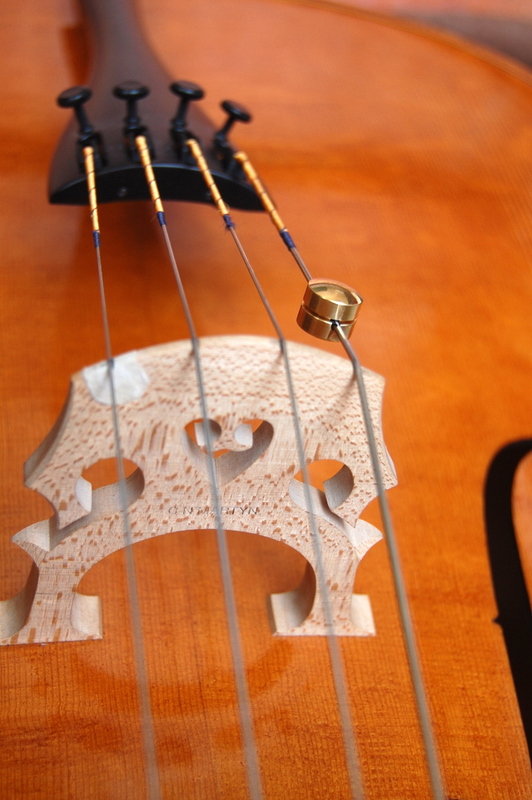 It’s claimed that this method of mounting has less effect on the general sound of the cello. They’re reasonably priced at $16 each but they have to be obtained from the USA, which is a pain if you live in England, and, unless you ordered the full range of 6 and tried them all, how could you be sure that you’ve chosen the one with the optimum weight? Using a Dremmel cut-off wheel and a slipstone, I ground a slot in 2 of them roughly the diameter of the C and G strings in width but leaving the depth just a touch on the shallow side. 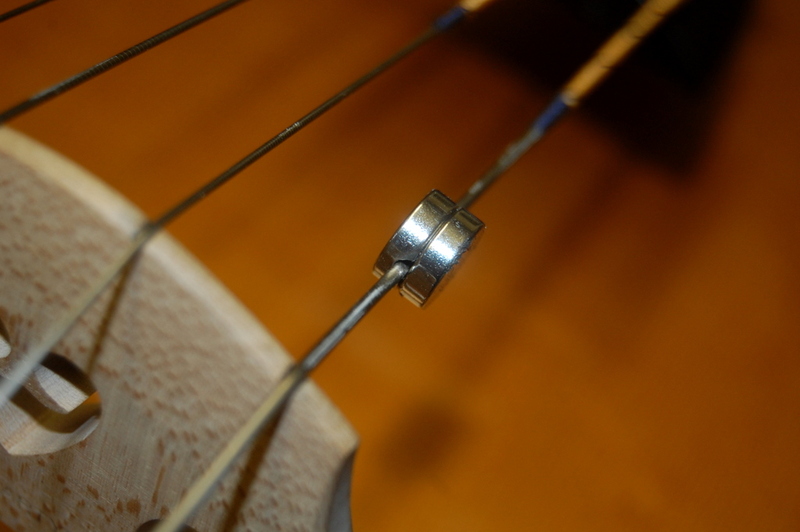 In combination with a second magnet, the grooved magnet will clamp onto the string firmly enough to stay in place while the instrument is played – see below. 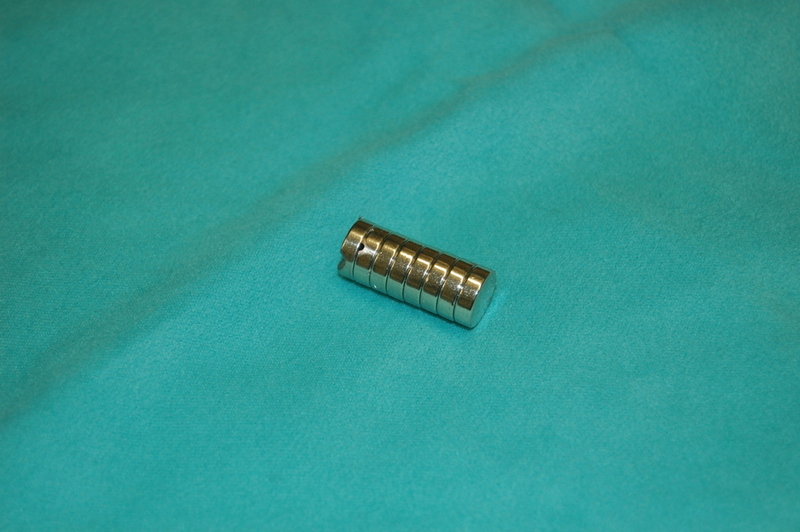 One obvious advantage of using magnets is that they’re easy to remove and re-position. Another is that by adding more magnets it’s possible to change the mass on the string and find the minimum required to suppress the wolf. After a surprisingly small amount of fiddling about, I discovered that positioning the magnets on the tail of the C string was significantly more effective than putting them on the G string. Two magnets there substantially suppressed the wolf and 4 abolished it altogether – without any discernible dampening effects on other notes. The conclusion was that the cello needed about 8 grammes additional mass at this position on the C string. The magnets worked so well that I was tempted to leave it at that. But then I worried about their strength and the possibility that, if anything ferrous came into proximity, there might be a disaster. 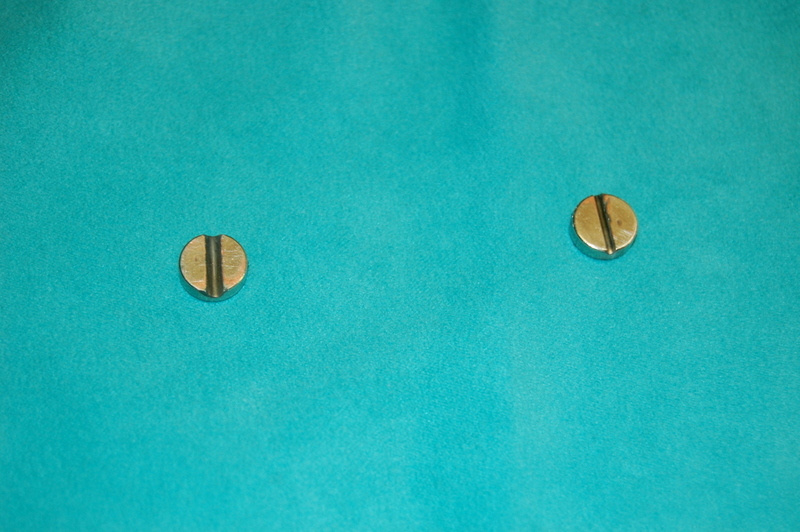 Perhaps better to replace them with something non-magnetic such as the brass ones made by New Harmony now that I knew the weight required. After all this, you may be wondering how the instrument sounds. Here’s a cellist friend trying it out. The recording was made using nothing more sophisticated than a portable Roland Edirol R-09 recorder and, as you can hear from the background noises, coughs, and conversation, I’ve left it completely unedited. It may be that I was lucky and my wolf was easy to tame. It’s entirely possible that the Lup-X is less effective on some instruments and, since I’ve only this one experience, I hesitate to recommend them. 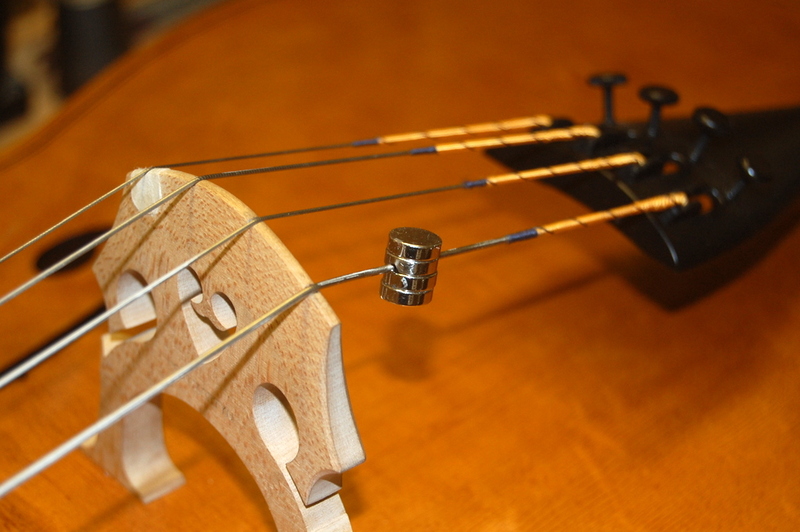 However, by using the magnet trick, it’s easy to find out whether it’s likely to work on your cello before buying one.